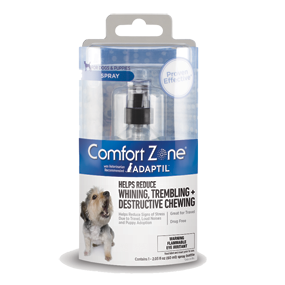 Comfort Zone® Spray with Adaptil® mimics a dog's natural calming pheromones. This spray signals to your dog that he is safe and secure, reducing his unwanted behavior. Comfort Zone® Spray with Adaptil® is clinically proven* to help reduce stress behaviors resulting from loud noises and new pet adoption. Adaptil® is used and recommended by veterinarians nationwide.